The proliferation of design and analysis platforms has made the use of one-to-one translators an increasingly unmanageable way to collaborate. Industry standard file formats like IFC are a step in the right direction, but are still lacking in some important ways. 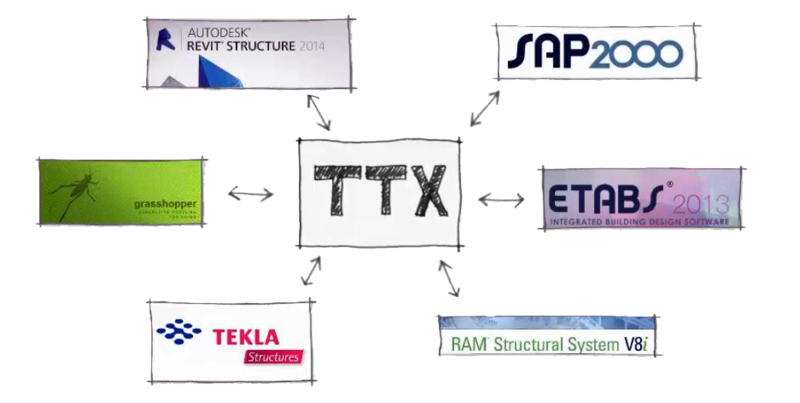 To respond to these shortcoming, CORE studio has developed TTX, a platform that can “talk” directly to multiple programs, translating data across modeling, analysis and documentation applications. TTX allows project teams to focus on their specialties in the platform of their choice and then update the corresponding models in all other platforms. In addition to model updates and translations, users can now leverage project information on a higher level using TTX. Using BIM metadata stored in the TTX database, team members can review project revision history by date, time, user or analysis program; can “roll-back” all models to review an earlier version of the project, can manage the merging of disparate models into one another; and can easily run queries and reports on a wide variety of elements and parameters. TTX is used on an increasing number of Thornton Tomasetti projects, including some of the most complex projects on our firm’s drawing boards. In addition to in-house use, TTX can be offered as part of a consulting service to our clients.